J. S. Bach’s Cantata 51: Jauchzet Gott in allen Landen featuring soprano Mary Southworth and trumpeter Jeff Shaffer will be the centerpiece of the Bach Vespers at St. Thomas on Sunday, October 21 at 4pm. Cantata 51, first performed in 1730 in Leipzig, is one of the great treasures of Bach’s work. The prelude for the service will be Handel’s aria “Eternal Source of Light Divine” from the Birthday Ode for Queen Anne, HWV 74, also featuring Southworth and Schaffer. The Bach Vespers at St. Thomas combines that ancient tradition of evening worship with the sacred cantatas of J. S. Bach, creating a beautiful and mystical experience. The musicians of the Cincinnati Bach Ensemble, and the new Bach Choir, under the direction of Dr. Carlton Monroe, present the cantatas in the context of worship, the setting for which they were written. 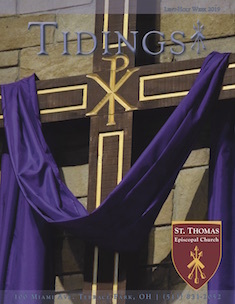 For more information, visit the Bach Vespers website at bachvespers.wordpress.com or go to the St. Thomas website at http://www.stthomasepiscopal.org.